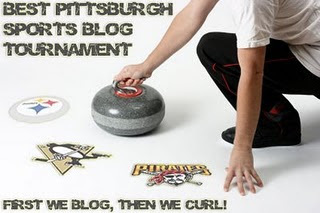 Sean's Ramblings is having another Best Pittsburgh Sports Blog Tournament. Last year we sat on the sidelines and watched The PensBlog win it all. This year we are part of it. We are an 8 seed and facing the mighty Behind the Steel Curtain in round one. Now I know how Morehead State feels when they make the NCAAs. Go vote over at Sean's place, and vote for This Is Getting Old. We are going to need all the help we can get. So click here and vote. First round voting ends Friday at 5 but do it now, slackers.